The final of eight teasers which will be released weekly until the first page is posted (August), introducing old and new characters. THE FIRST PAGES WILL BE POSTED ON THE WEBSITE http://typhoonlagoon.sunkra.be NEXT WEEK WEDNESDAY! 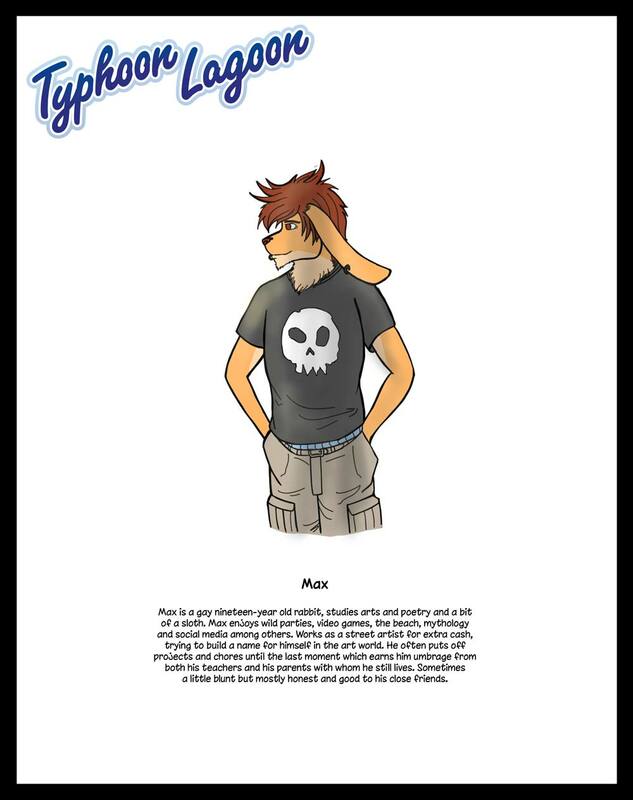 "Max is a gay nineteen-year old rabbit, studies arts and poetry and a bit of a sloth. Max enjoys wild parties, video games, the beach, mythology and social media among others. Works as a street artist for extra cash, trying to build a name for himself in the art world. He often puts off projects and chores until the last moment which earns him umbrage from both his teachers and his parents with whom he still lives. Sometimes a little blunt but mostly honest and good to his close friends."